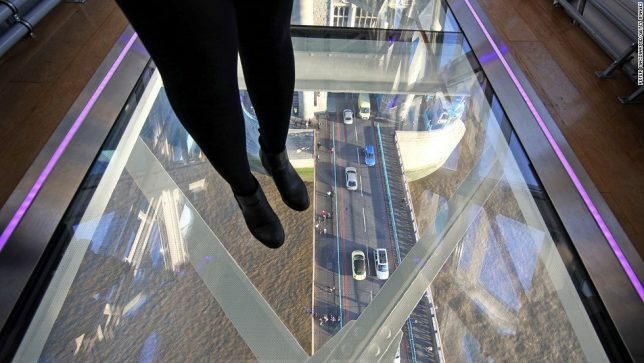 Glass floors give us a glimpse at what’s beneath our feet – whether that’s the historical bones of a building, a swimming pool on the next floor, the city streets or the bottom of a canyon – while freaking us out over the potential of breakage. 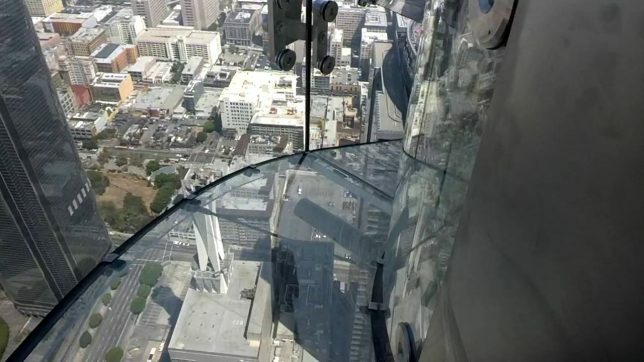 And yes, sometimes these glass floors really do crack, no matter how ‘unbreakable’ they’re supposed to be, including those situated hundreds of feet above the ground. 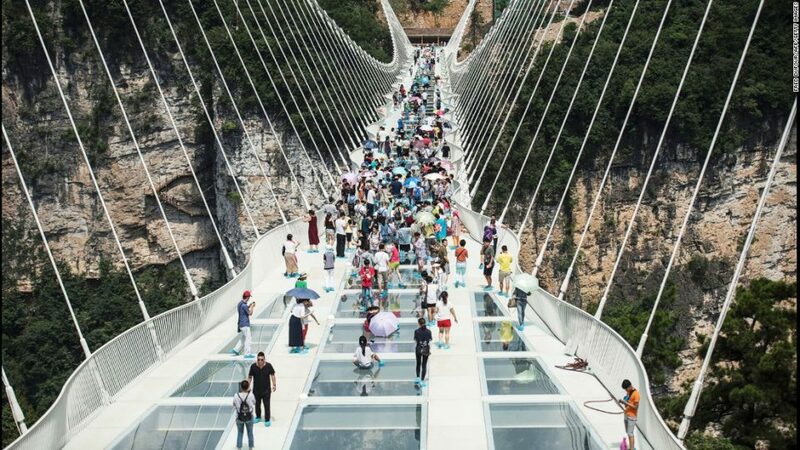 You’d better not be afraid of heights if you’re gonna cross this glass-bottomed bridge in China, suspended a stomach-turning 590 feet above ground level in China’s central Hunan Province. 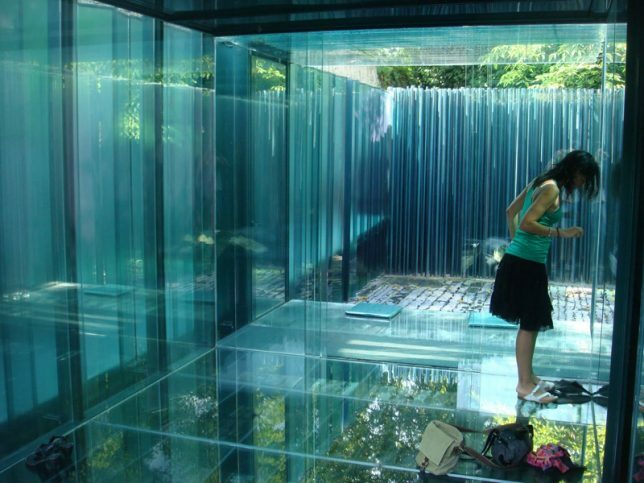 Known locally as Haohan Quiao, the bridge features glass panels measuring 24 millimeters thick, which are supposedly 25 times stronger than regular glass. 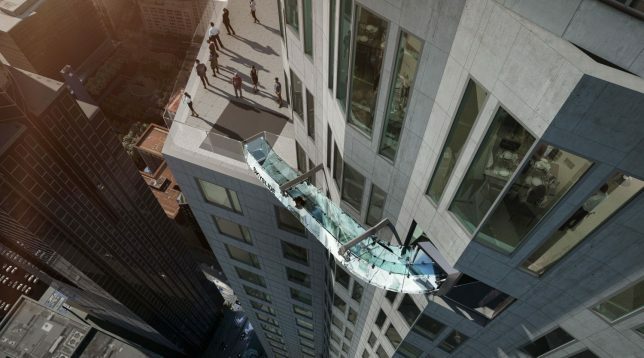 But this isn’t the only such bridge in China. 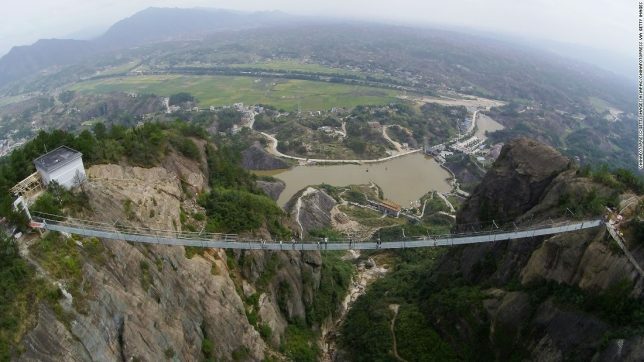 The second is the structure hanging 1350 feet over the bottom of Zhangjiajie Grand Canyon – and this bridge really did crack at one point under an unexpected volume of visitors, forcing its closure. 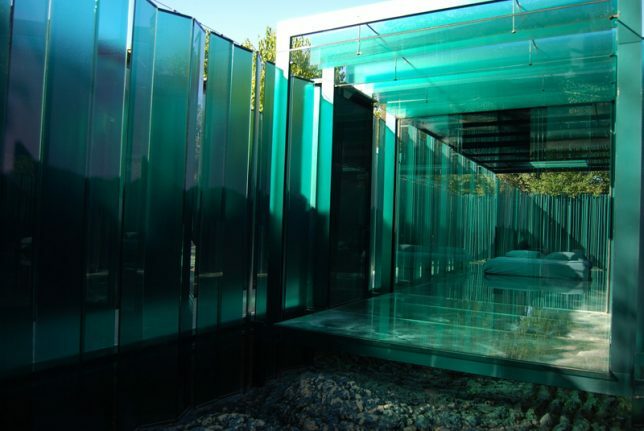 This one is officially the world’s longest glass bridge. 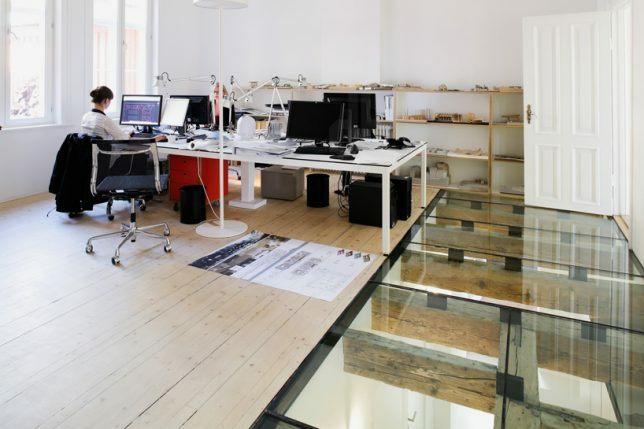 A 19th century villa gets a modern update by architect Reiulf Ramstad, while this transparent section of floor reveals the old beams hidden beneath the newer materials for a reminder of the building’s history. 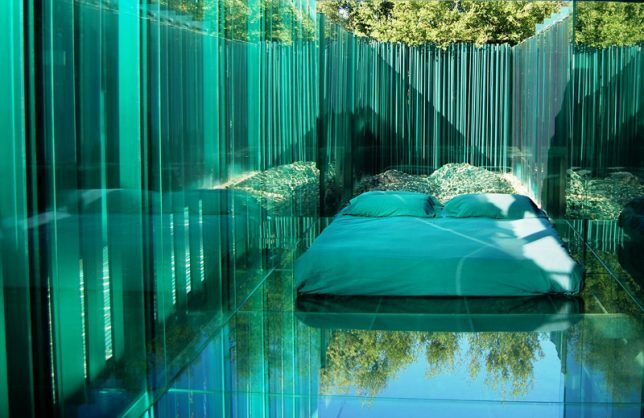 You’d never guess that just beyond the traditional-looking 13th century farmhouse at hotel Les Cols Pavellons in the Catalan town of Olot is a series of ultramodern glass pavilions. 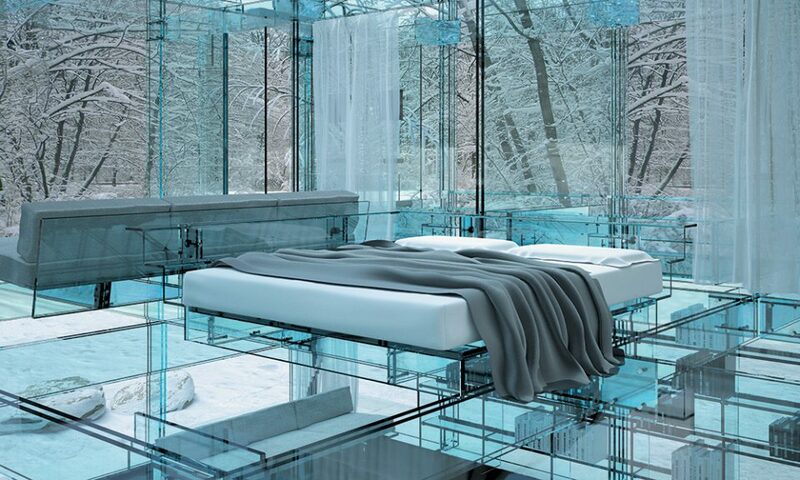 These ‘zen’ hotel rooms are like crystal cubes housing almost nothing but a bed, a glass table and chairs and a bath for a minimalist experience that’s all about experiencing the design. 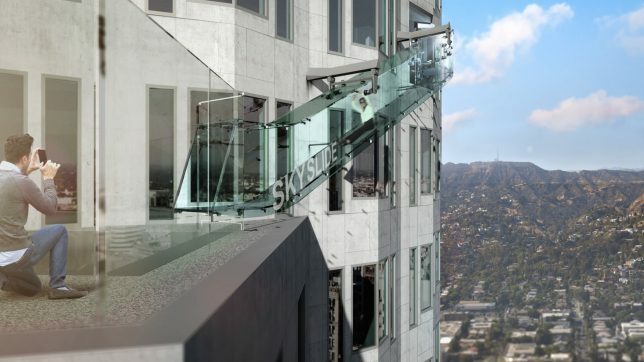 More than just a glass-bottomed observation deck, which is becoming more common all over the world, this attraction at the U.S. Bank Tower in downtown Los Angeles is a fully functioning slide that chutes guests 45 feet from a window on the 70th story to a terrace on the 69th. 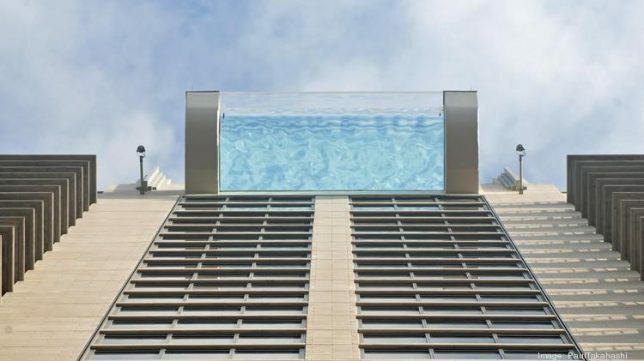 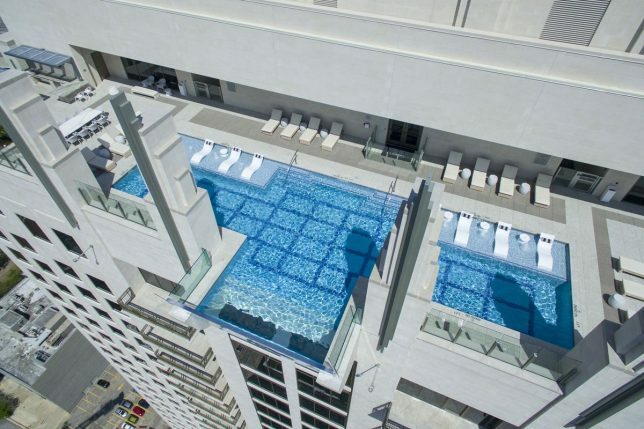 Houston is home to an awesome plexiglass pool that cantilevers 10 feet past the edge of the building, 500 feet above street level. 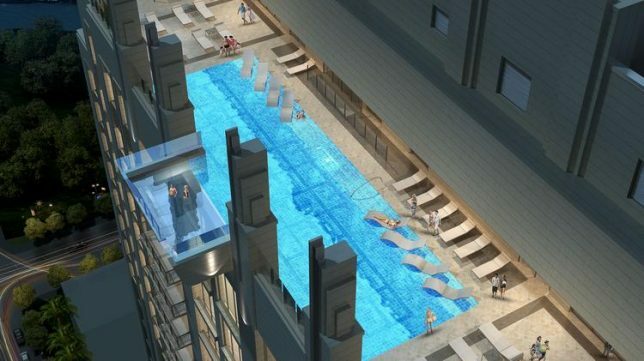 Installed at the new Market Square Tower apartment building by Jackson & Ryan Architects, the skypool offers views of the Houston skyline, and stops passersby in their tracks on the sidewalk below.